The movie starts with a rooftop panning shot of New York City. Then ... the pan begins at the Waldorf-Astoria Hotel at 301 Park Avenue (at upper right), takes in the Commerce Building at 708 3rd Avenue then scans down to the Chrysler building at 405 Lexington Avenue at 42nd Street (click image to enlarge). ... in 1939 ... this vintage aerial photo of a DC-4 airplane over Manhattan just happens to reveal whence the panorama was filmed. The camera was set up at the top of the 37-story Daily News Building at 220 E. 42nd Street near 2nd Avenue and panned from right to left between the arrows. ... and Now, here's a recent photo of the same panorama through adjacent windows on the 26th floor of the Daily News Building. Although taken 11 stories below the movie's vantage point, the twin bronze-clad cupolas of the Waldorf-Astoria can be seen above the skyline on the right with the Commerce Building just to its left and the Chrysler Building at far left (click image to enlarge). Those three buildings and the Daily News Building are still to be found at their original locations, proud ambassadors of the Art Deco era that spawned them. Here they are today - from left to right the Chrysler Building, the Commerce Building, the Waldorf-Astoria and the Daily News Building. Cut to a street corner where the signs declare in two different ways that we are in the Theatre District at Times Square. Then ... just steps away, the camera closes in on the marquee of the Bijou theatre advertising a new play by Myra Hudson, a successful playwright and wealthy heiress from San Francisco. Opposite and a little further down is another theatre, the Booth, where Jack Palance had his first stage role, a one-liner, in the comedy ‘The Big Two’. ... and Now, the Bijou, at 209 W. 45th Street in Manhattan's Theatre District, had been there since 1917. In 1951 it became a CBS studio and then a D. W. Griffith Theatre before reverting back to the Bijou in 1965 but was finally demolished to make way for the Marriott Marquis Hotel - the Bijou site is now covered by the hotel's garage. 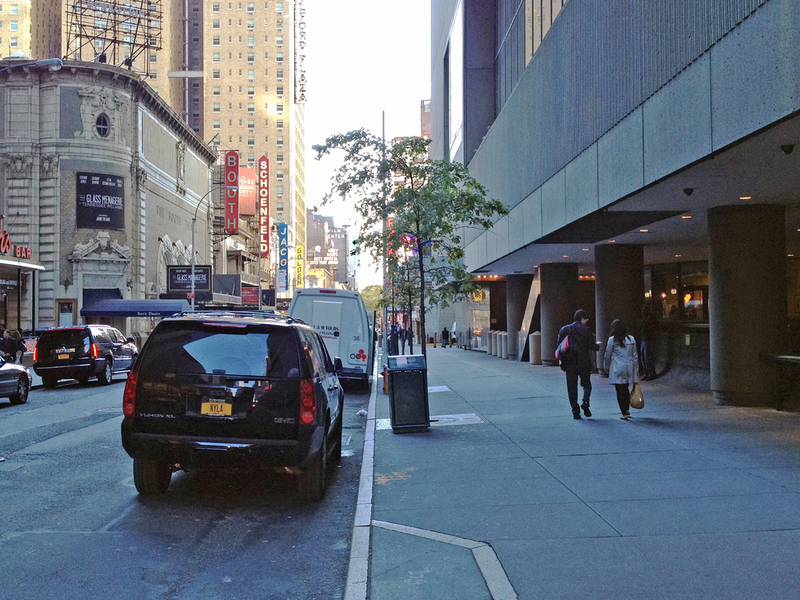 In this west-facing view down 45th Street the hotel is to the right. Across the street the Booth Theatre is still in business today (map) - note the billboard frame on its roof, still there 60 years on. During reheasals in the Bijou Myra (Joan Crawford) watches Lester Blaine (Jack Palance), the actor hired to play the romantic lead, and decides he is not suitable for the role, summarily firing him. (Who can blame her - Palance's menacing visage usually brought him bad-guy roles). Lester is not happy to get the news and lets her have it before storming out.